SPAIN is facing a ‘serious constitutional crisis’ as the rival political parties battle for control of Congress. With the exception of the PP, all parties are demanding the acting government surrender control by submitting itself to regular question times. PSOE, Ciudadanos and Podemos are demanding that weekly congress sittings should involve questions to President Rajoy and members of his executive. 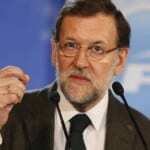 Rajoy however insists that his acting government should only be answerable to the courts and insists that the Ministry of Defence will not participate in any such session. If the parties refuse to back down it could spark a constitutional crisis. “It is unheard of for a government to declare itself in contempt of Congress,” said PSOE deputy Antonio Hernando. Seems daft to have to go to court just in order to communicate with Rajoy. Can’t they impeach him or drop him off a cliff, or something? A nice walk with Sanchez along the Caminito del Rey would be nice at this time of year. This could turn out to be very interesting, especially the bit about the Spanish MOD. Maybe another general will usurp parliament except this time there will be no Moroccan shock troops for him to use. If it does all come on top we know exactly what Brussels will do, the same as they did with the breakup of Yugoslavia – absolutely nothing. No meaningful political change in Spain comes from the outside. Only internal tinkering that maintains the over all state machinery will be allowed. One can buy/bribe/manipulate their way into the higher echelons, but the echelons’ structural relations will maintain. Howard Wirada, the famous political historian of Spanish and Latin American politics (whatever you think of his overall work) very rightly pointed out that in the Spanish (and S. American) corporatist states, corporatism has proven, unfortunately, to be a very, very stable political system, one in which popular democracy can barely make a dent. We in the US may now become a crazy variant of the Spanish situation – the US Congress is acting in contempt of both the US Constitution and its own rules in regard to Supreme Court nominations, budgets and other critical international matters. And, in a really bizarre twist in Republican politics, it’s horrid to realize that Trump and his rude mouth would be a more stable choice than the redneck, orthodox neo-facsist, Texan sociopath Ted Cruz. Since it now appears that Bernie Sanders can’t make it, there is only the disingenuous Hillary to fend off Trump or Cruz. But assuredly, she will maintain Wall Street’s power over politics. Very oddly, Trump’s understanding of Wall St corruption is better than Hillary’s. Sad state of affairs in the West at a time when leadership is crucial. very good post. Re. Central/South America – if it looks like democracy might get in the way then death squads are formed, they do their work and all returns to ‘normality’. I love your description of Cruz – lots of seriously disturbed religious crazies were allowed to emigrate from Europe, uninvited to other peoples’ countries when they were better used as fish food in the Channel, North and Irish Seas. How were their mentalities going to be changed by moving to another part of the planet. Bernie Sanders never had a chance against primary programming in school,TV and the media in general, the same sadly applies to the UK. Yes Trump knows the game because he is part of it. Spain, well Spaniards just shrug their shoulders and the same fixed game is played. Two books that you might find interesting, written by a man that was persecuted first by Austrian/German Nazis and then by Christian crazies in the USA and died in prison there – The Mass Psychology of Fascism and Listen Little Man – Wilhelm Reich. He forsaw all this mass brainwashing well before WW11. Simply told – the little man needs to be told what to do and does’nt really mind what it is as long as he/she does’nt have to take responsibility and it’s all wrapped up in one ‘ism’ or another. Reich would have got on very well with Orwell, they saw the same nightmare approaching. Wrote my dissertation in anthropology on propaganda and indoctrination in totalist states, and post-doc in human development and neuroscience specializing on effects on cruelty and abuse on cognition. Impressive chas. But what the hell does it mean? More importantly, should we be worried? Not so much, except perhaps, rational statements are generally more interesting and engaging than snarky comments.